A keyhole garden is a type of raised bed which originated in parts of Africa struck by droughts interspersed with torrential rain. The charity Send A Cow, which provides livestock and training in natural organic farming techniques to poverty-stricken parts of Africa, developed the keyhole garden as a sustainable way to help families to become more self-sufficient, to grow more vegetables in a restricted space, at very low cost, and reliably, despite the vagaries of the climate. The basic principles are simple. The keyhole is a circular raised bed, with, crucially, a tube or basket in its centre which is filled with kitchen compost: peelings, outer leaves, eggshells, the usual stuff you throw in the compost bin. A pathway is cut out of the circle leading from the edge to the central basket so that you can easily refill the tube and indeed reach all parts of the keyhole garden with ease. Viewed from above the bed looks keyhole-shaped, hence the name. The keyhole garden is meant to be as low-cost and sustainable as possible, so the bed is filled, lasagne style with various types of organic matter: cardboard (lots of cardboard), dried leaves and grass cuttings, coffee grounds, leaf mould, straw, newspaper, manure, wood ash, and only topped with a layer of topsoil to plant your first seeds or seedlings into. The walls of the garden can be made from stones, rocks, bricks, anything you have to hand. A quick search on the web throws up keyhole gardens edged with old wine bottles, sandbags, car tyres, and wooden blocks. To a large extent the keyhole garden looks after itself. The soil in the bed is fed by nutrients from the compost breaking down and seeping from the central basket. You should only really need to water the central basket - in Africa, household grey water is used to keep the central basket moist - and the shape of the bed should ensure that water is distributed to the plants. At 2 metres across - the maximum recommended diameter both for ease of access and to ensure plants near the perimeter still get moisture and nutrients form the central basket - the keyhole garden can reliably supply vegetables on a year-round basis. I was intrigued by the pictures of different keyhole gardens in Lesotho and Uganda on the Send A Cow site and also at Inspiration Green, here. Instantly appealing, some look as thought they have been thrown together, others more like permanent structures. As they use whatever materials are to hand and can be recycled, no two keyhole gardens look exactly the same. 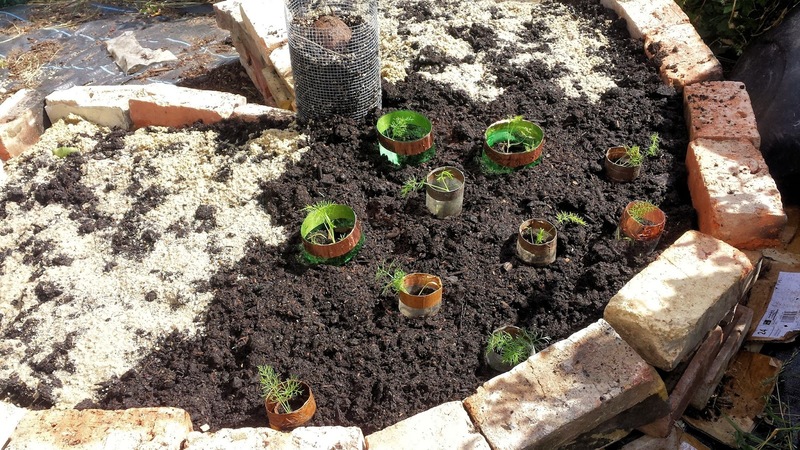 We may not have the specific challenges of poor thin soil and dry conditions that they do in Lesotho or Uganda, but the sustainability and permaculture aspects of the keyhole garden appealed very strongly to me, and I wanted to try building one on the plot. I see no reason why this idea of a central nutrient source shouldn't work in other raised beds as well. 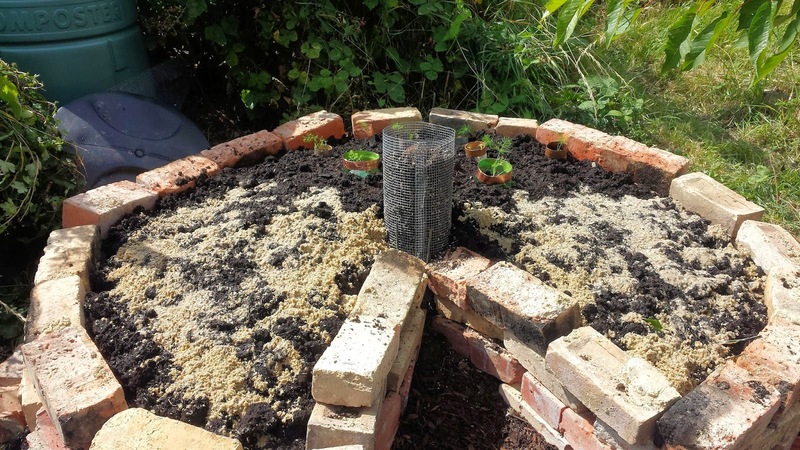 Obviously the circular shape of the keyhole garden means there are no hard-to-reach corners where the goodness from the compost never reaches, but the principle still holds good. I always like the idea of specialist beds. Here is where the nutrient-rich growing medium will feed leafy salads, or get the tomatillos and/or physalis off to a flying start. The compactness of the keyhole garden also makes it easy to protect - from birds, or slugs, for example. Great for courgettes, too, for those whose conventional compost heap is a bit too stringy and uncomposted to successfully grow cucurbits. The first task is to find an area for your keyhole garden and clear the ground, digging out any weeds and roots. There are no hard and fast rules about size. Send A Cow says that 2metres in diameter is a good workable maximum size. My cleared area didn't quite match that: the diameter here is 1.8metres. To measure out the area of your keyhole garden, push a stick in the ground where the centre will be. Tie string to the stick and measure out enough string for the radius of your garden (90cm in my case). Tie the string at the other end to a second stick, then extend the stick out the full length of the string. If the ground is soft enough, you can drag the stick marking the circumference around the centre stick to make a line on the ground. The ground was pretty hard when I did this, so I marked the 90cm radius with pea sticks at intervals. I'm afraid you have to peer at this photo to spot the pea sticks but they are there. Where the sticks have marked the circumference, start laying the external wall for the garden. Here in north London we don't have a ready supply of boulders and rocky outcrops that they do in Lesotho, but what we do have is a lot of people making improvements to their properties. And where there are extensions being built, there will also be skips out in the road full of old bricks. It took me just two skip-diving missions to find 40 bricks to line my keyhole garden and I didn't have to travel further than two miles from my front door. The rules say you should always ask for permission before removing anything from someone else's skip, and I'd go along with that. Apart from the etiquette aspect, once you've told the builder, or the householder, about your brick recycling project, they often offer help, whether it's just loading up the boot of your car with their bricks, or to tell you there's building work on the go just around the corner. Next, add your central basket. Again, there is no precise material that should be used, so long as it's permeable. You can use sticks placed close together, you can weave your own with pliable canes such as willow, or you can reuse an old piece of wire mesh as I did here, bending it into a cylinder and securing with wire ties top and bottom. I also used the pea sticks to support and secure the mesh into position in the middle of the bed. Now create the pathway that makes the keyhole shape of the bed, leading from the outside edge into the central basket. If it's feasible, it's a good idea to cut the keyhole path on the north side of the bed, the part of the bed that will be cooler and shadier, leaving the growing area sunny and south-facing. Now it's time to start building up the bed. I used cardboard as my base layer: a good weed suppressant but also organic so it will decompose and help to enrich the soil. In Send A Cow's videos of keyhole gardens in Lesotho, they often scatter rusty tin cans over the base of the bed, to add iron to the soil. Here, newspaper covers any gaps in the cardboard. ... and comfrey leaves for lots of good nutrients. But only the leaves - don't bury any root, unless of course you want to grow comfrey in the keyhole garden. You can also add wood ash, leaf mould, manure. I added manure and then a tin layer of top soil to sow the seeds in. The central basket has a smaller diameter than the recommended 30-50cm, but then the bed is smaller anyway. It does however need a lid to keep the kitchen compost from drying out: currently I have capped it with an upended coconut shell, so that the rainwater will still run down the sides of the coconut and into the basket. These Florence fennel seedlings were donated by a fellow allotmenteer and I've surrounded them with a copper anti-slug collar as a precautionary measure. My resident allotment wreckers, the car and the fox, have been quite active over the last few weeks, so I added a net, lifted with hoops to keep them off the soil. Mr Tod, in particular, gets very excited by eggshells, and I really don't want to find the contents of the central basket scattered across the allotment. 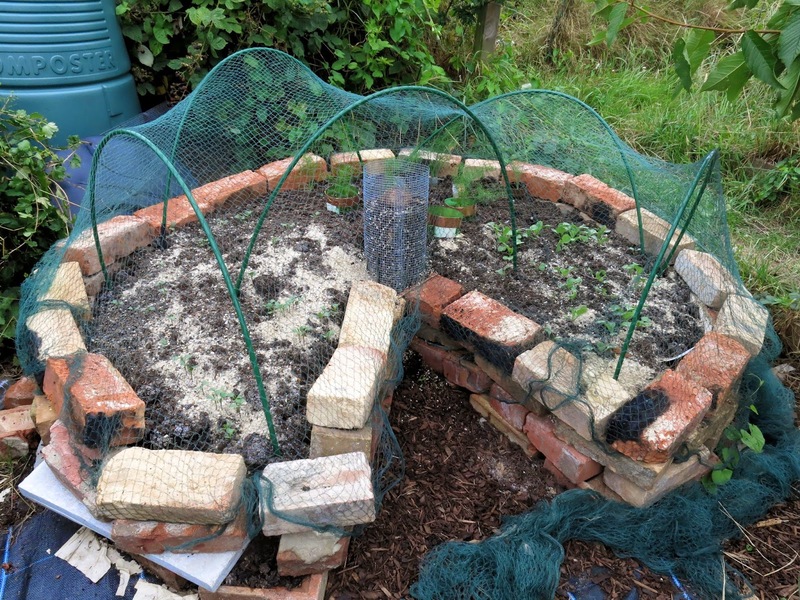 I may look for a more permanent framework and line it with fleece or clear polythene in the spring to create a keyhole greenhouse for early seedlings. As well as the Florence fennel, I sowed seeds for two types of purple radish, Violet de Gournay and Hilds Blauer Herbst Und Winter , and some kailans (Chinese broccoli). These all germinated in 3-4 days and are growing strongly. Baker Institute - step-by-step diagrams and list of benefits: http://bakerinstitute.org/media/files/page/4d152358/khg_card_final_english.pdf. This page also lists plants recommended and not recommended for keyhole gardens. Under Not Recommended, tomatoes and squash are included, which is odd as many of the photos of keyhole gardens both in Africa and elsewhere, clearly show tomatoes and particularly squash growing happily in the beds.